"These little skewers are simple to make and a great addition to your appetizers at any Christmas party." 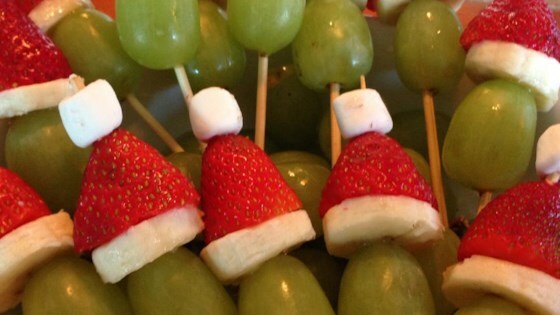 Thread 1 grape, 1 banana slice, 1 strawberry (narrow end facing up), and 1 marshmallow onto 1 toothpick to resemble the Grinch's head in his red hat. Repeat with remaining grapes, banana slices, strawberries, and marshmallows. Another twist on this that I have seen is to use green olive, grape tomato, and white cheese. Fun to take to a pitch in. Easy and so cute! Instead of toothpicks, I made these on top of wooden meat skewers and arranged them in a holiday vase for a party. They were a hit! this was a hit at my open house. I borrowed Monica's idea, put them on meat skewers and arranged in a 1 pint mason jar. it worked great! Easy & grandkids loved them. Used coffee stirrers from Starbucks. No pointed sticks for little ones. Length perfect. Easy to make, changed it up a bit added white cheese for the hat trim and put on a toothpick with a white fuzzy top. Big hit at our pot luck lunch.